What should a good UV flashlight consist of? Lots and lots of UV-A light! The most important task of the UV flashlight is to actually emit this ultra-violet light, and with a light strength that allows the user to perform the task, even in bright daylight conditions. And with the ultraviolet light we mean of course the UV-A light. UV-A LED’s have been on the market for only a few years now and are still expensive. 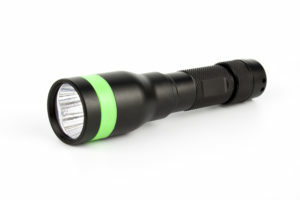 As UV-A light is not visible to the human eye, the user is not able to determine without a measurement device if the flashlight actually emits this desired UV-A light. Many manufacturing companies use this fact to use inferior – but cheap- blue LED’s in their flashlight, which emit little or no UV-A light. Instead these flashlights emit the visible color violet and blue. The result is that the object that should glow up under influence of UV-A light now stay hidden to the flashlight and the human eye. And with this non-performance comes the mistrust in this technology. The UV flashlights produced by us are equipped with the strongest UV-A LED’s available to the market. And they emit true UV-A light, with its emission peak around 365 nm. This wavelength has proven to be the best UV-A wavelength to visualise a wide variety of items: from blood spatters to particles and from chemical residues to aflatoxin. It is also important to know that our flashlights emit no visible light, which often visualise items, which are not important. As a result they distract the observation from the operator. For this reason some in industries use a standard where the light distribution from a UV flashlight, does not allow any visible light. 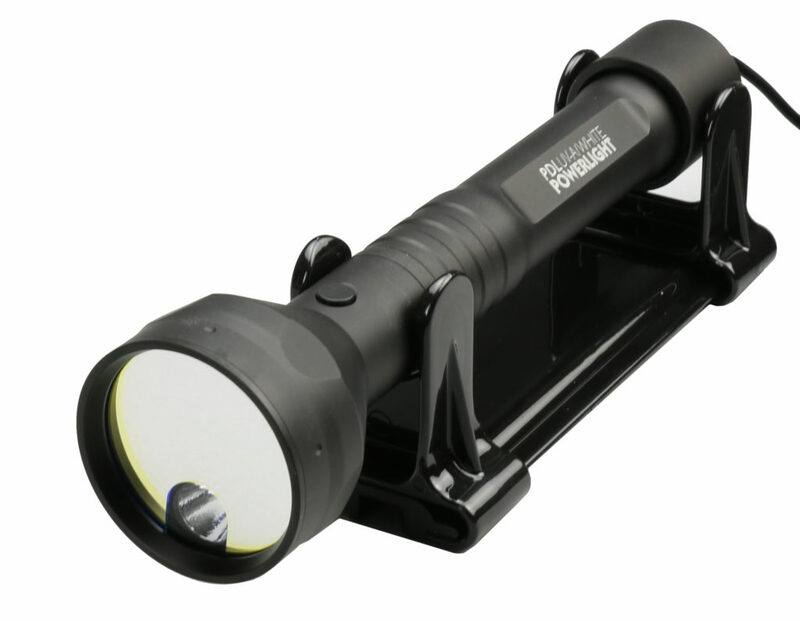 The flashlight is going to be used frequently and in a wide variety of environments: In darkness, in rain, in clean room areas etc. It has to be executed in a robust design, rain protection and it should be able to withstand an accidental drop. Our housings are made from high grade aluminium, IP65 executed or higher (hose proof execution) and drop test proof! And not only because we say so, but because our accredited laboratory has tested these according the relevant standards – and approved these flashlights. Our flashlights are equipped with powerful UV-A LED’s and all this energy they consume has to come from some-where. As energy source we made no compromises and have chosen for the best batteries available: The Panasonic Lithium Ion rechargeable 18650 batteries. These batteries have received global recognition for being the industrial norm in term of reliability and their environmental friendliness. Our flashlights emit only the harmless UV-A light, even with intensive use of our flashlight, there is never any danger for the user. Only direct eye contact with the UV light should be avoided. If the application for which the UV-A flashlight is used does involve some risk of supposed eye contact, then we recommend the use of safety glasses. These are optionally available.